We've already covered the And rule and the Or rule, two very important rules. Now we'll talk about another rule, the Binomial Situation. The first thing I wanna make clear, this is a problem type unlikely to appear on the test except as a very hard problem. So this is very important to understand about the material in this video. If you are the type of student who's aiming for an elite math score, if you really are trying to get almost. Every math problem right on the test, well, then, yes. You may see this, you need to know this. But, if you're the type of student, you're just trying to man, manage the basics. You know you're not gonna get the hardest math problems right. You just want to make sure that you know the basic material so you get a respectable math score. Well then definitely you should know the n rule. Definitely you know, you should know the or rule those show up all over place. This you may not even see, so you could probably completely disregard this especially if you start watching this video and you find it to difficult. Don't worry just let it go, it's not something that you're gonna have to worry about. So we have some simple event, like rolling a die, or flipping a coin, and we're going to do that event several times. Times, and so of course one of the assumptions is that all the trials will be independent, that's always true with dice and coins, and notice that it doesn't matter at all whether I roll one die five times or roll five dice at once, whether I flip one coin seven times or flip seven coins at once. Both of those are completely identical as far as the probability is concerned. So the probability of success in an individual trial is obvious, is given or obvious from context. I think almost all the problems I've ever seen in the binomial situation on the test, have been either about dice or coins, so it's usually obvious. What's the probability of flipping ten coins, and getting this many heads. So heads is a success. What's the probability role in this many dice in getting this many fives or if it wouldn't five, is a success. So success is determined in something else. Whatever they were asking the probability of, that is what we're referring to as quote unquote a success. Two, the number of trials is decided before hand, so, in other words, that's just the way that the problem is framed. The problem frames, alright, ten coins are gonna be flipped so that's not up for debate. There gonna be ten trials. That's already fixed. What is the probability of rolling seven dice and getting exactly two sixes, something like that. These would the binomial situations, now how do we calculate, let's look at a couple examples, first of all a very easy example, three fair coins are flipped, so of course these are all going to be independent, very easy, what is the probability of exact, getting exactly two heads? Now, naively, you might think, okay, that's our answer, one eighth. But we have to be very careful here. What are the different ways that the scenario two heads can play out? For example, I could get heads, heads, tails, or I could get heads, tails, heads, or I could get tails, heads, heads. Those would be the three ways it would play out if we were flipping one coin three times in a sequence. Another way to think about it, suppose we were flipping 3 completely different coins. Suppose we were flipping a nickel, a dime, and a quarter. When we flip those three coins, there's three different ways that we can get two heads with the single tail showing up either on the nickel or the dime or the quarter, and so there are three different ways for it to play out. These are mutually exclusive, each one has a probability of of one eighth, as we just figured out, so we add them, and so this adds up to a grand total of 3/8, and that is the probability of flipping three fair coins and getting exactly two heads. Let's look at another that's a little more challenging. Practice problem two. Ten dice, each fair with six sides rolled simultaneously. So we're doing ten different trials. Again, all of these are independent. What is the probability of getting exactly two fives among them. So in other words, what we're gonna get, we're gonna get one die is five, the other die is five, and then we're gonna have eight more. The probability of getting something other than a five, getting any of the other five faces, well that would be five sixths, so that is the probability for each one of these. Now, course, all of these are independent, so we can multiply. So one way to say this is this is one sixths, times one sixths, times five sixths, times five sixths, times five sixths, times five sixths, times five sixths, times 5/6, let's say times 5/6 times 5/6. Okay, we could write all that out. Let's obtain that in the key step. Much easy to say of this way. One sixth to the power of two, five sixth to the power of eight Now, no one in the right line is gonna expect you to calculate these fractions. In a fact what prob we going to happen is that the answer choices will just be written in these forms. Which printed like this. So you don't even have to do this calculation you just have to recognize the right set up. Notice again, this is not the answer. Now we have to deal with the problem of, how many different ways can those two successes, those two fives be distributed among the ten coins. Well, you may recognize that as a counting question. Now if this is not familiar you may want to go back and look at the combination video and the counting section. But essentially what we have here is ten choose two. Now of course we could figure that out relatively easily. But typically on the test, what I've noticed they don't even expect you to do this. What they just do is they write the answer with all of this together, and this would be way the answer is printed on the multiple choices, so as long as you can recognize that; then you can answer the question. So they save you the work of doing the calculation on something like this. So now, let's just look at the general formula to summarize. 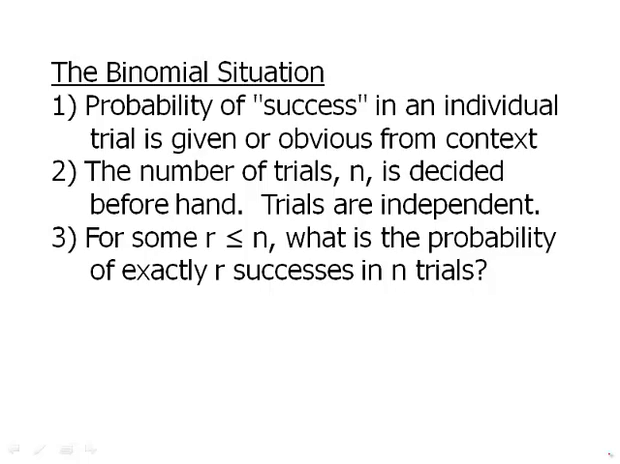 The general binomial formula, we're going to say lower case p is the probability of success on one trial. So for a coin, that's one half for any face on a die that is one sixth. N is the number of trials, R is the number of successes, so we have r successes, so that's why we have p to the r, we have success happening r times. If we have rs successes, that means we have n-r trials that are not successes, and so we have whatever is not a success, happening in minus r times, and, finally, we have to figure out how many different ways.